State Tax Help - Sautner & Associates, Inc.Sautner & Associates, Inc.
At Sautner & Associates, Eileen Sautner is not only an Enrolled Agent, Licensed Tax Consultant, but also a U.S. Tax Court Practitioner. The license of U.S.T.C.P. allows her to represent a taxpayer in U.S. Tax Court. To date, there are only 4 individuals with this license in the state of Oregon. If this is the first year you are using our service, we will ask for copies of your prior years’ returns. We prefer to review them for prior records that carry over as well as potential reduction of tax. We need you to bring all information returns that you receive; such as 1099’s, W-2’s, brokerage stock statements, etc. We can provide you with an organizer to assist in putting your information together. However, we prefer to work with original source documents. Many times the documents you receive may be misinterpreted and reported incorrectly. If you have paid estimated taxes, we need a complete record of your payments to federal and state including the dates and amounts. If you choose to use our service, we honor the trust you have in us. We want your experience with us to be educational as well as comfortable. Tax preparation for the taxpayer can be extremely stressful; we believe this is a team effort. We try to glean all possible insight in our visit that will be to your benefit. If you have income outside of Oregon, what are you required to file? If you have moved here from another state, we need to know the dates of your residency. Each information documents (example W-2) usually includes the taxable amount for each state. There are special rules to prove residency and those would need to be discussed in an interview. If you own rental property in another state, you may have to file a state return for that other state. However, if you are an Oregon resident, Oregon takes precedence. Sautner & Associates provides expertise in the wide spectrum of filing requirements for businesses. This includes individuals who file as a Sole Proprietor, S or C corporations, partnerships, LLC, and payroll taxes. In order to prepare accurate tax returns with the greatest tax savings, complete and accurate records are critical. If you need assistance with recordkeeping we are here to help. Each state has different requirements for state filing. And, even if there is a loss on your business (example S Corporation and Partnership) there will be a state tax. Why should I pay a preparer assist me? The U.S. tax code grows more complicated every year and spans thousands of pages — even government experts can’t agree exactly how long it is. So it’s not surprising that millions of Americans hire professional tax preparers to complete their returns. There are different licenses for tax preparation; C.P.A., Tax Attorney, Enrolled Agent and in Oregon there is a Licensed Tax Consultant. As a professional, we are bound by ethical standards. An Enrolled Agent is also authorized to represent you before the IRS on all tax matters, including audits, collection and appeals. But remember, the taxpayer is still legally responsible for all information on the return. Our role is to ask appropriate questions, gather information provided by the taxpayer and in the event it appears the information is either not complete or possibly fraudulent, we are limited to asking. If we believe the information provided could possibly trigger an audit we will advise you our opinion. If the taxpayer makes a mistake or intentionally defrauds the government, they will be on the hook for any additional taxes, interest and penalties — even possible prosecution. As a professional preparer we must not only be educated on current tax law, we must provide complete privacy and confidentiality, and calculate the lowest tax liability allowed by law. 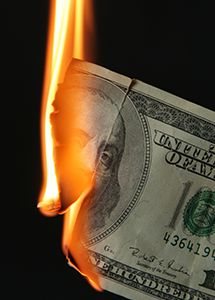 Don’t Let Your Hard Earned Money Go Up In Smoke!